The Communist Party of Vietnam (CPV)[lower-alpha 1] is the founding and ruling political party of the Socialist Republic of Vietnam. Although nominally it exists alongside the Vietnamese Fatherland Front, it maintains a unitary government and has centralized control over the state, military, and media. The supremacy of the Communist Party is guaranteed by Article 4 of the national constitution. The current party's leader is Nguyễn Phú Trọng, who holds the titles of General Secretary of the Central Committee and Secretary of the Central Military Commission. The party is known for the advocacy of what it calls a 'socialist-oriented market economy'. The highest institution of the CPV is the party's National Congress which elects the Central Committee. In between party congresses, the Central Committee is the supreme organ on party affairs. Immediately after a party congress, the Central Committee elects the Politburo and Secretariat, and appoints the First Secretary, the highest party office. In between sessions of the Central Committee, the Politburo is the supreme organ on party affairs. However, it can only implement decisions based upon the policies which have been approved in advance by either the Central Committee or the party's National Congress. As of 2014, the 11th Politburo comprises 16 members. The Communist Party traces its linage back to 1925, when Ho Chi Minh established the Vietnamese Revolutionary Youth League, commonly referred to as Thanh Niên. Thanh Niên sought to make use of patriotism in an effort to end the colonial occupation of the country by France. The group sought political and social objectives—national independence and the redistribution of land to working peasants. Thanh Niên was designed to prepare the ground for a revolutionary armed struggle against the French occupation. In 1928 the headquarters of the Thanh Niên organization in Canton was forced underground by Chinese nationalists led by Kuomintang (KMT). This led to a national breakdown within the organization, which lead indirectly to a split within Thanh Niên. On 17 June 1929, more than 20 delegates from cells throughout the Tonkin region held a conference in Hanoi, where they declared the dissolution of Thanh Nien and the establishment of a new organization called the Communist Party of Indochina (ICP). The other faction of Thanh Niên, based in the central and southern administrative districts of the country, renamed themselves the Communist Party of Annam in late 1929. The two organizations spent the rest of 1929 engaged in polemics against one another in an attempt to gain a position of hegemony over the radical Vietnamese liberation movement. A third Vietnamese Communist Party emerged around this time, called the League of Indochinese Communists (Vietnamese: Đông Dương Cộng sản Liên Đoàn), which was not connected with Thanh Niên. The League of Indochinese Communists had its roots in another national liberation group which had existed in parallel with Thanh Niên, and saw itself as a rival to the latter. The two warring splinters of Thanh Niên joined with individual members of a third Marxist group called the Communist Party of Vietnam, founded by Phan Bội Châu at a "Unification Conference" held in Hong Kong from 3–7 February 1930. At a later conference, the party was renamed the Indochinese Communist Party (Vietnamese: Đông Dương Cộng sản Đảng, often abbreviated to ICP). During its first five years of existence, the ICP attained a membership of about 1500 and had large contingent of sympathizers. Despite the group's small size, it exerted an influence in a turbulent Vietnamese social climate. Poor harvests in 1929 and 1930 and an onerous burden of debt served to radicalize many peasants. In the industrial city of Vinh, May Day demonstrations were organized by ICP activists, which gained critical mass when the families of the semi-peasant workers joined the demonstrations to express their dissatisfaction with the economic circumstances they faced. As three May Day marches grew into mass rallies, French colonial authorities moved in to quash what they perceived to be dangerous peasant revolts. Government forces fired upon the assembled crowds, killing dozens of participants and inflaming the population. In response, local councils were organized in villages in an effort to govern themselves locally. Repression by the colonial authorities began in the fall 1931, and about 1300 people were eventually killed by the French and many more were imprisoned or deported as government authority was reasserted and the ICP was effectively wiped out in the region. General Secretary Tran Phu and many leaders of the Central Committee were arrested and killed. Lê Hồng Phong was assigned to Communist International to restore the movement. The party was restored in 1935, and Lê Hồng Phong was elected its General Secretary. In 1936, Hà Huy Tập was appointed General Secretary instead of Lê Hồng Phong, who returned to the country to restore the Central Committee. The Second World War drastically weakened the grip of France on Indochina. The fall of France to Nazi Germany in June 1940 and the subsequent collaboration of Vichy France with the Axis powers of Germany and Japan served to delegitimize French claims of sovereignty. The European war made colonial governance from France impossible and Indochina was occupied by Japanese forces. 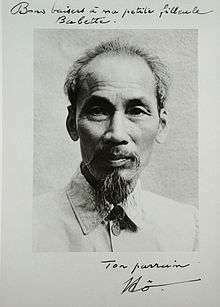 Party leader Ho Chi Minh returned to Vietnam in February 1941 and established a military organization known as the League for the Independence of Vietnam (Vietnamese: Việt Nam Độc Lập Đồng Minh Hội, commonly referred to as "Vietminh"). It was the most uncompromising fighting force against the Japanese occupation, and gained popular recognition and legitimacy in an environment that would develop into a political vacuum. Despite its position as the core of the Vietminh organization, the Indochinese Communist Party remained very small through the war years, with an estimated membership of between 2,000 and 3,000 in 1944. Following the August Revolution (1945) organized by the Vietminh, Ho became Chairman of the Provisional Government (Premier of the Democratic Republic of Vietnam) and issued a Proclamation of Independence of the Democratic Republic of Vietnam. Although he convinced Emperor Bảo Đại to abdicate, his government was not recognized by any country. He repeatedly petitioned American President Harry S. Truman for support for Vietnamese independence, citing the Atlantic Charter, but Truman did not respond. After the successful takeover of Hanoi, Vietnam was taken over by Chinese nationalist forces and the French military. In response to this, the Communist Party was dissolved and in practice, the Vietminh became a member of a large struggle for independence. The organization was ostensibly dissolved, but its core was still functioning. According to the CIA, membership grew to about 400,000 members by 1950. 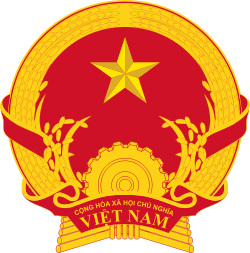 In 1951, during the war for independence, the officially dissolved Communist Party was officially re-established and renamed the Workers Party of Vietnam (Vietnamese: Đảng lao động Việt Nam). The Indochinese War against French forces lasted until 1954 with the Vietnamese victory at the Battle of Điện Biên Phủ. 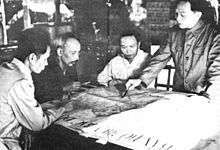 At the second Party Congress it was decided that the Communist Party would be split into three; one party for Vietnam, Laos and Cambodia. However, in an official note it said that the "Vietnamese party reserves the right to supervise the activities of its brother parties in Cambodia and Laos." The Cambodian party, the Khmer People's Revolutionary Party, was established in April 1951, and the Lao party, the Lao People's Revolutionary Party, was formed four years later, on 22 March 1955. The third Party Congress, held in Hanoi in 1960, formalized the tasks of constructing socialism in what was by then North Vietnam, or the Democratic Republic of Vietnam (DRV), and committed the party to the liberation of South Vietnam. In 1975, the Workers Party of North Vietnam was merged with the People's Revolutionary Party of South Vietnam. At the fourth Party Congress in 1976, it was named the Communist Party of Vietnam;the party explained that the name change was made in light of the "strengthened proletariat dictatorship, the development of the leadership of the working class ... a worker-peasant alliance." The fourth Party Congress comprised 1,008 delegates who represented 1,553,500 party members, an estimated three percent of the Vietnamese population. A new line for socialist construction was approved at the congress, the Second Five-Year Plan (1976–80) was approved and several amendments were made to the party's constitution. The party's new line emphasized building socialism domestically and supported socialist expansion internationally. The party's economic goal was to build a strong and prosperous socialist country in 20 years. The economic goals set for the Second Five-Year Plan failed to be implemented, and between the fourth and fifth Party Congresses, a heated debate about economic reform took place. The first was at the sixth Central Committee plenum of the fourth Party Congress in September 1979, but the most revealing one occurred at the 10th Central Committee plenum of the fourth Party Congress which lasted form 9 October to 3 November 1981. The plenum adopted a reformist line, but it was forced to moderate its position when several grass-root party chapters rebelled against its resolution. At the fifth Party Congress, held in March 1982, the General Secretary Lê Duẩn said the party had to strive to reach two goals; to construct socialism and to protect Vietnam from Chinese aggression, but priority was given to socialist construction. The party leadership acknowledged the failures of the Second Five-Year Plan, claiming that their failure to grasp the economic and social conditions aggravated the country's economic problems. The Third Five-Year Plan (1981–85) emphasized the need to improve living conditions and the need for more industrial construction, but agriculture was given top priority. Other points were to improve the deficiencies in central planning, improve economic trade relations with the COMECON countries, Laos, and Kampuchea. Two flags—the flag of the Communist Party, and the national flag of Vietnam—flying side by side. While Lê Duẩn continued to believe in the goals set in the Third Five-Year Plan, leading members within the Communist Party were losing their trust in the system. It was in this mood that the 1985 price reform was introduced – market prices were introduced, which led to a sudden increase in inflation. By 1985, it became apparent that the Third Five-Year Plan had failed miserably. Lê Duẩn died on 10 July 1986, a few months before the sixth Party Congress. A Politburo meeting held between 25 and 30 August 1986, paved the way for more radical reforms; the new reform movement was led by Trường Chinh. At the sixth Party Congress, Nguyễn Văn Linh was elected the new General Secretary – this was a victory for the party's old guard reformist wing. The new leadership elected at the Congress would later launch Đổi Mới and establish the framework for the socialist-oriented market economy. The economic reforms were initiated alongside a relaxation of state censorship and freedom of expression. At the seventh Party Congress in which Nguyễn Văn Linh retired from politics, he reaffirmed the party's and country's commitment to socialism. Đỗ Mười succeeded Nguyễn Văn Linh as General Secretary, Võ Văn Kiệt, the leading reformist communist, was appointed prime minister and Lê Đức Anh, was appointed president. In 1994, four new members were appointed to the seventh Politburo, all of whom opposed radical reform. At the June 1997 Central Committee meeting, both Lê Đức Anh and Võ Văn Kiệt confirmed their resignation to the ninth National Assembly, which was dissolved in September 1997. Phan Văn Khải was approved as Võ Văn Kiệt's successor, and relatively unknown Trần Đức Lương succeeded Lê Đức Anh as president. At the fourth Central Committee plenum of the eighth Party Congress, Lê Khả Phiêu was elected General Secretary and Đỗ Mười, Lê Đức Anh and Võ Văn Kiệt officially resigned from politics and were elected Advisory Council of the Central Committee. Nông Đức Mạnh succeeded Lê Khả Phiêu in 2001 as general secretary. Nông Đức Mạnh held the top spot until the 11th National Congress (held in 2011), and was succeeded by Nguyễn Phú Trọng. The National Congress is the party's highest organ, and is held once every five years. Delegates decide the direction of the party and the Government at the National Congress. The Central Committee is elected, delegates vote on policies and candidates are elected to posts within the central party leadership. After decisions taken at the National Congress are ratified, the congress is dissolved. The Central Committee implements the decisions of the National Congress during the five-year period between congresses. When the Central Committee is not in session, the Politburo implements the policies of the National Congress. The Central Committee is the CPV's most powerful institution. It delegates some of its powers to the Secretariat and the Politburo when it is not in session. It appoints the president, the chairman of the National Assembly and the prime minister, but the appointments have to be approved by the National Assembly. When the Vietnam War ended in 1975, the Vietnamese leadership, led by Lê Duẩn, began to centralize power. This policy continued until the sixth National Congress, when Nguyễn Văn Linh took power. Linh pursued a policy of economic and political decentralization. The party and state bureaucracy opposed Linh's reform initiatives; because of this, Linh tried to win the support of provincial leaders, causing the powers of the provincial chapters of the CPV to increase in the 1990s. The CPV lost its power to appoint or dismiss provincial-level officials in the 1990s; Võ Văn Kiệt tried to wrestle this power back to the centre during the 1990s without success. These developments led to the provincialization of the Central Committee; for example, increasing numbers of Central Committee members have a background in provincial party work. Because of these changes, power in Vietnam has become increasingly devolved. The number of Central Committee members with a provincial background increased from 15.6 percent in 1982 to 41 percent in 2001. The current President of Vietnam, Trương Tấn Sang, was directly elected from the provinces at the eighth Party Congress in 1996. Because of the devolution of power, the powers of the Central Committee have increased substantially; for example, when a two-thirds majority of the Politburo voted in favour of retaining Lê Khả Phiêu as General Secretary, the Central Committee voted against the Politburo's motion and voted unanimously in favour of removing him from his post of General Secretary. The Central Committee did this because most of its members had a provincial background, or were working in the provinces. These members were the first to be affected when the economy began to stagnate during Lê Khả Phiêu's rule. The Central Committee elects the Politburo in the aftermath of the Party Congress. The General Secretary of the Central Committee is the highest office within the Communist Party, is elected by the Central Committee, and can remain in post for two five-year terms. The General Secretary presides over the work of the Central Committee, the Politburo, the Secretariat, is responsible for issues such as defence, security and foreign affairs, and chairs meetings with important leaders. The General Secretary holds the post of Secretary of the Central Military Commission, the party's highest military affairs organ. The Politburo is the highest organ of the Communist Party between Central Committee meetings, which are held twice a year. The Politburo can implement policies which have been approved by either the previous Party Congress or the Central Committee. It is the duty of the Politburo to ensure that resolutions of the Party Congress and the Central Committee are implemented nationally. It is also responsible for matters related to organization and personnel, and has the right to prepare and convene a Central Committee plenary session. The Politburo can be overruled by the Central Committee, as happened in 2001 when the Politburo voted in favour of retaining Lê Khả Phiêu as General Secretary; the Central Committee overturned the Politburo's decision, dismissed Lê from politics, and forced the Central Committee to elect a new General Secretary after the ninth National Congress. The members of the Politburo are elected and given a ranking by the Central Committee immediately after a National Party Congress. According to David Koh, the Politburo ranking from the first plenum of the 10th Central Committee onwards, is based upon the number of approval votes by the Central Committee. Lê Hồng Anh, the Minister of Public Security, was ranked second in the 10th Politburo because he received the second-highest number of approval votes. Tô Huy Rứa was ranked lowest because he received the lowest approval vote of the 10th Central Committee when he stood for election to the Politburo. The 11th Politburo was elected by the Central Committee after the 11th National Congress and consists of 16 members. Decisions within the Politburo are made through collective decision-making. Since 10th Central Committee, the duties and responsibilities of the members of the Politburo and those of the General Secretary, President, Prime Minister, the Chairman of the National Assembly and the Permanent member of the Secretariat have been specified separately. The Secretariat is headed by the General Secretary and decisions within it are made through collective decision-making . The Secretariat is elected and the membership size is decided by the Central Committee immediately after the National Congress. It is responsible for solving organizational problems and implementing the demands of the Central Committee. The Secretariat oversees the work of the Departments of the Central Committee. It is also responsible for inspecting and supervising the implementation of resolutions and directives on fields regarding the party on economic, social, defence, security and foreign affairs, and it is directly responsible for the coordination of a number of party bodies. The Secretariat supervises the preparation for issues raised at Politburo meetings. The Central Military Commission is appointed by the Politburo and includes members from the military. The commission is responsible to the Central Committee and between meetings, the Politburo and the Secretariat. The Secretary of the Central Military Commission is the party's General Secretary while the post of Deputy Secretary is held by the Minister of National Defence. The commission can issue guidelines on military and defence policies, and has leadership in all aspects of the military. The General Political Department is subordinate to the commission. The Central Inspection Commission is the party organ responsible for combating corruption, disciplining members and wrongdoing in general. It is the only organ within the party which can sentence or condemn party members. The Commission, and its chairman and deputy chairmen, are elected by the first plenum of the Central Committee after a National Party Congress. Due to the party's policy of democratic centralism, a local inspection commission can only investigate a case if the inspection commission directly superior to it consents to the investigation. The state and party are guided by "Hồ Chí Minh Thought"
Vietnam is a socialist republic with a one-party system led by the Communist Party. The CPV espouses Marxism–Leninism and Hồ Chí Minh Thought, the ideologies of the late Hồ Chí Minh. The two ideologies serve as guidance for the activities of the party and state. According to the Constitution, Vietnam is in a period of transition to socialism. Marxism–Leninism was introduced to Vietnam in the 1920s and 1930s, and Vietnamese culture has been led under the banners of patriotism and Marxism–Leninism. Hồ Chí Minh's beliefs were not systematised during his life, nor quickly following his death. Trường Chinh's 1973 biography of Hồ emphasized his revolutionary policies. The thoughts of Hồ Chí Minh were systematized in 1989 under the leadership of Nguyễn Văn Linh. Hồ Chí Minh Thought and Marxism–Leninism became the official ideologies of the CPV and the state in 1991. The CPV's claim to legitimacy was retained after the collapse of communism in 1989 and the dissolution of the Soviet Union in 1991 by its commitment to the thoughts of Hồ Chí Minh, according to Sophie Quinn-Judge. According to Pierre Brocheux, the current state ideology is Hồ Chí Minh Thought, with Marxism–Leninism playing a secondary role. Some claim that Hồ Chí Minh Thought is used as a veil for a party leadership who has stopped believing in communism, but others rule this out on the basis that Hồ Chí Minh was an avid supporter of Vladimir Lenin and the dictatorship of the proletariat. Still others see Hồ Chí Minh Thought as a political umbrella term whose main function is to introduce non-socialist ideas and policies without challenging socialist legality. Since the Republic was founded, the key ideology has been Marxism–Leninism, but since the introduction of a mixed economy in the late 1980s and 1990s, it has lost its monopolistic ideological and moral legitimacy. Because of the Đổi Mới reforms, the party could not base its rule on defending only the workers and the peasants, which was officially referred to as the "working class-peasant alliance". In the constitution introduced in 1992, the State represented the "workers, peasants and intellectuals". In recent years, the party has stopped representing a specific class, but instead the "interests of the entire people", which includes entrepreneurs. The final class barrier was removed in 2006, when party members were allowed to engage in private activities. In the face of de-emphasising the role of Marxism–Leninism, the party has acquired a broader ideology, laying more emphasis on nationalism, developmentalism and becoming the protector of tradition. — Lai Quoc Khanh explaining Hồ Chí Minh's way of thinking. According to Hồ Chí Minh, before it becomes socialist, a society must evolve through national liberation and the construction of a people's democratic regime. While national liberation is the means of taking power, the establishment of a people's democratic regime requires the total destruction of the feudalist, colonialist, and imperialist society. Only through this destruction can Vietnam transit to socialism. Lai Quoc Khanh, a journalist in the theoretical Communist Review wrote, "The people's democratic regime is an objective necessity in the development course of Vietnamese society." A people's democratic regime, however, is not a socialist regime. For instance, in a people's democratic regime private ownership still exists, while in a communist or socialist stage of development, ownership does not exist. Vietnamese communists consider the distribution of land during Hồ Chí Minh's early rule as an example of people's democracy. However, this is not the only difference. The logic is that difference in the ownership of productions lead to different modes of production. Hồ Chí Minh said that the basic economic tenets of a people's democratic regime was state ownership of certain segments of production – considered socialist since the state belongs to the people, cooperatives, which were half-socialist in nature but would develop into fully socialist economic entities, and the personal economics of individual handicraft and peasantry, which would later develop into cooperatives), private capitalism and state capitalism, where the state shares capital with capitalists to develop the country further. Since these economic basics relied on different types of ownership, the economy of the people's democratic regime cannot be considered socialist, hence the regime is not socialist. For example, in the socialist-oriented market economy, the state-owned sector will be the dominant sector, hence the socialist character of the economy dominates. The political platform of the second Party Congress held in 1951 stated that, "The people's democratic revolution is neither an old-type capitalist democratic revolution nor socialist revolution, it is a new-type capitalist democratic revolution which will evolve into socialist revolution without experiencing a revolutionary civil war." To be more specific, the people's democratic regime is a substage in capitalist development. While Hồ Chí Minh supported the position that Vietnam had entered the stage of transition to socialism in 1954, he held the belief that Vietnam was still "a democratic regime in which people are the masters" and not socialist. To reach the socialist stage of development, the development of the state sector was of utmost importance – the lack of which would, according to Hồ Chí Minh, lead to failure. The platform of the 11th National Congress held in January 2011 stated, "This is a profound and thorough revolutionary process and a complicated struggle between the old and the new for qualitative changes in all aspects of social life. It is essential to undergo a long period of transition with several steps of development and several mixed social and economic structures." According to the party's General Secretary Nguyễn Phú Trọng, during the transition to socialism, socialist factors of development compete with non-socialist factors, which include capitalist factors. Nguyễn said, "Along with positive aspects, there will always be negative aspects and challenges that need to be considered wisely and dealt with timely and effectively. It is a difficult struggle that requires spirit, fresh vision, and creativity. The path to socialism is a process of constantly consolidating and strengthening socialist factors to make them more dominant and irreversible. Success will depend on correct policies, political spirit, leadership capacity, and the fighting strength of the Party." — Nguyễn Văn Linh, the leader who initiated Đổi Mới, opposed the view that fundamental principles of Marxism–Leninism were to be changed, or rejected because of the introduction of market-elements into the economy. The Party's propaganda poster commemorating the 80th founding and equating the Party with "peace, prosperity and happiness"
"The state economy plays a key role; the collective economy is constantly consolidated and developed; the private economy is one of the driving forces of the collective economy; multiple ownership, especially joint-stock enterprises, is encouraged; the state and collective economies provide a firm foundation for the national economy. The relations of distribution ensure fairness, create momentum for growth, and operate a distribution mechanism based on work results, economic efficiency, contributions by other resources, and distribution through the social security and welfare system. The State manages the economy through laws, strategies, plans, policies, and mechanisms to steer, regulate, and stimulate socio-economic development." Unlike in capitalist countries, a socialist-oriented market economy does not "wait for the economy to reach a high level of development before implementing social progress and fairness, nor 'sacrifice' social progress and fairness to the pursuit of mere economic growth." Policies are enacted for the sole purpose of improving the people's standard of living. The reality of Vietnam after the revolution is different from what I imagined when I joined the party ... Life has shown us that it is much more complicated. The thing is, we received Marxism in a theoretical sense, not in a full sense, and the information was not very precise. Marxism came to Vietnam through the interpretation of Stalin and Mao. It was simplified to a great extent. And now we read the classic works of Marx and other founders, and we find that things were not so simple. Though the social conditions under which Marx wrote his works are not the same as now, the principles are the same. Yet those principles were not interpreted precisely correctly." In a resolution of the 10th National Party Congress, it was decided to renovate and strengthen the party's foreign policy. As of 2010, the Commission for External Relations of the Central Committee has good relations with 222 political parties in 115 countries. According to the party, this is an "important contributions to accelerating the renovation process, industrialization and modernization of Vietnam." The party does not only have foreign relations with communist parties; relations with non-communist parties have been established because their countries are economically important to Vietnam. Relations with other communist and workers parties are very important, and are built on "solidarity, friendship, mutual support in the struggle for socialism in the spirit of Marxism-Leninism and pure internationalism of the working class." It exchanges views with such parties on theoretical and practical issues regarding socialist construction, party building and current problems. The CPV is active in international communist and workers party gatherings, such as the International Meeting of Communist and Workers' Parties. The CPV currently maintains relations with over 100 communist and workers' parties. The party has emphasized the importance of relations with the Lao People's Revolutionary Party and the Cambodian People's Party. It also maintains good relations with the Communist Party of China, the Communist Party of Cuba, and the Workers' Party of Korea. The CPV sent delegations to the 8th Congress of the Communist Party of the Russian Federation in 2008, the 5th Congress of the Party of Italian Communists in 2008, the 20th Congress of the Communist Party of India in 2008, the 9th Communist Party of India (Marxist) in 2008, the 18th Congress of Communist Party of Greece in 2009, the 9th Congress of the Communist Party of Denmark in 2009, the 18th Congress of the Spanish Communist Party in 2009, the 8th Congress of the Communist Party of Nepal (Marxist–Leninist) in 2009, the 12th Congress of the Communist Party of Brazil in 2009 and that of the Peruvian Communist Party in 2010. The CPV maintains also friendly relations with Latin American left-wing political parties. Delegation of CPV participated on 22nd Meeting of Foro de São Paulo in El Salvador in June 2016. 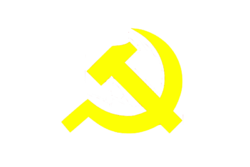 ↑ Sometimes referred to as the Vietnamese Communist Party (VCP). 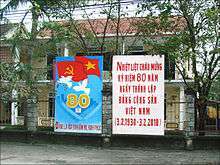 ↑ "Communist Party of Vietnam celebrates 85th anniversary of founding". Global Times. 2 February 2015. Retrieved 2 February 2015. ↑ Huynh 1982, pp. 63–64. 1 2 Huynh 1982, p. 64. ↑ Huynh 1982, p. 70. ↑ Huynh 1982, p. 76. ↑ Huynh 1982, p. 114. ↑ Huynh 1982, p. 119. 1 2 Huynh 1982, p. 120. 1 2 3 Huynh 1982, p. 122. ↑ Kolko 1994, p. 27. 1 2 Kolko 1994, p. 28. 1 2 3 Kolko 1994, p. 30. ↑ Kolko 1994, p. 31. ↑ Kolko 1994, pp. 30-31. 1 2 Kolko 1994, p. 32. ↑ Zinn 1995, p. 460. ↑ "Collection of Letters by Ho Chi Minh". Rationalrevolution.net. Retrieved 2009-09-26. ↑ Zinn 1996, p. 461. ↑ Leifer 1994, pp. 175–176. ↑ Stuart-Fox 1997, pp. 80–81. ↑ Stuart-Fox 1997, p. 81. ↑ Van & Cooper 1983, p. 55. ↑ Reis 2012, p. 15. 1 2 Van & Cooper, p. 55. ↑ Võ 1990, p. 125. ↑ Võ 1990, p. 126. ↑ Võ 1990, p. 127. ↑ Võ 1990, p. 141. ↑ Võ 1990, pp. 165–166. ↑ Võ 1990, p. 168. ↑ Corfield 2008, pp. 111–112. ↑ Võ 1990, p. 181. ↑ Võ 1990, pp. 183–185. ↑ Largo 2002, p. 2. ↑ Jeffries 1993, p. 238. ↑ Largo 2002, p. 3. ↑ Largo 2002, pp. 10–11. ↑ Abuza 2001, p. 14. 1 2 Van & Cooper 1983, p. 56. ↑ Ashwill & Thai 2005, p. 47. ↑ East & Thomas 2003, p. 574. ↑ Rowley 2008, p. 187. ↑ Abuza 2001, p. 9. ↑ Abuza 2001, p. 10. ↑ Abuza 2001, p. 11. 1 2 Abuza 2001, p. 12. ↑ Abuza 2001, pp. 11–12. ↑ Van & Cooper 1983, p. 69. ↑ Taylor 2004, p. 43. 1 2 3 4 5 6 7 "Điều lệ Đảng Cộng sản Việt Nam thông qua tại Đại hội đại biểu toàn quốc lần thứ XI của Đảng" [Charter of the Communist Party of Vietnam which was approved at the 11th National Congress]. 11th National Congress of the Communist Party of Vietnam. Archived from the original on 25 January 2013. Retrieved 26 October 2012. ↑ Porter 1993, p. 83. ↑ Stern 1993, pp. 3–4. ↑ Porter 1993, pp. 66–67. ↑ Stern 1993, p. 64. ↑ "Political system". 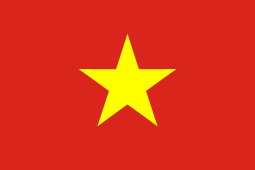 Government of the Socialist Republic of Vietnam. Retrieved 20 April 2012. ↑ "Preamble of the Constitution of the Socialist Republic of Vietnam". Government of the Socialist Republic of Vietnam. Retrieved 20 April 2012. ↑ "Vietnam culture overview". Government of the Socialist Republic of Vietnam. Retrieved 16 April 2012. ↑ Quinn-Judge 2002, p. 2. 1 2 Gillespie 2006, p. 90. ↑ Quinn-Judge 2002, p. 256. ↑ Brocheux 2007, p. 186. 1 2 3 Gillespie 2006, p. 91. ↑ Gillespie 2006, p. 92. ↑ Gillespie 2006, pp. 91–92. 1 2 3 4 5 6 7 8 Khanh, Le Quoc (28 December 2010). "A philosophy perspective on people's democratic regime from Ho Chi Minh's ideology". Tạp chí Cộng Sản. Central Committee of the Communist Party of Vietnam. Retrieved 4 November 2012. ↑ Trong Phuc, Nguyen (4 November 2011). "Party's awareness on socialism in Viet Nam from the Platform of 1930 to the Platform on national construction in the period of transition to socialism (revised and supplemented in 2011)". Central Committee of the Communist Party of Vietnam. Retrieved 4 November 2012. 1 2 3 4 5 6 7 Nguyễn, Phú Trọng (7 November 2012). "Socialism and the path to Socialism-Vietnam's Perspective". Tạp chí Cộng Sản. Central Committee of the Communist Party of Vietnam. Retrieved 1 December 2012. ↑ Elliott 2012, p. 75. 1 2 3 4 5 6 7 8 9 Huu Nghia, Le (17 January 2011). "Những đặc trưng thể hiện tính ưu việt của xã hội xã hội chủ nghĩa mà nhân dân ta đang xây dựng" [These characteristics show the superiority of the socialist society that our people are building] (in Vietnamese). Central Committee of the Communist Party of Vietnam. Retrieved 4 November 2012. 1 2 Rứa, Tô Huy (8 March 2007). "Sustainable value and significance of the Communist Manifesto". Central Committee of the Communist Party of Vietnam. Retrieved 4 November 2012. ↑ Elliott 2012, p. 60. 1 2 3 4 "Communist Party of Viet Nam Holds 10th National Congress". Tạp chí Cộng Sản. Central Committee of the Communist Party of Vietnam. 18 December 2010. Retrieved 3 November 2012. ↑ "VN attends meeting of communist parties". Vietnamplus.vn. 11 December 2011. Retrieved 3 November 2012. ↑ "Vietnam sticks to goal of becoming industrialized country by 2020". tuitrenews.vs. 31 March 2014. Retrieved 31 March 2014. ↑ "Foro de Sao Paulo destaca avances del pueblo vietnamita". www.fmln.org.sv. 24 June 2016. Retrieved 25 June 2016. Ashwill, Mark; Thai, Ngoc Diep (2005). Vietnam Today: A Guide To A Nation At A Crossroads. Intercultural Press. ISBN 9781931930093. Brocheux, Pierre (2007). Ho Chi Minh: a Biography. Cambridge University Press. ISBN 9780521850629. East, Roger; Thomas, Richard (2003). Profiles of People in Power: The World's Government Leaders. Routledge. ISBN 9781857431261. Elliott, David W. P. (2012). Changing Worlds: Vietnam's Transition from Cold War to Globalization. Oxford University Press. ISBN 978-0195383348. Gillespie, John Stanley (2006). Transplanting Commercial Law Reform: Developing a 'Rule of Law' in Vietnam. Ashgate Publishing. ISBN 9780754647041. Hyunh, Kim Khanh (1986). Vietnamese Communism, 1925–1945. Cornell University Press. ISBN 9780801493973. Jeffries, Ian (1993). Socialist Economies and the Transition of the Market: A Guide. Routledge. ISBN 9780415075800. Kolko, Gabriel (1994). Anatomy of a War: Vietnam, the United States, and the Modern Historical Experience. New Press. ISBN 9781565842182. ——— (1997). Vietnam: Anatomy of a Peace. London and New York, NY: Routledge. ISBN 9780415159906. Largo; et al. (2002). Vietnam: Current Issues and Historical Background. Nova Publishers. ISBN 978-1590333686. Leifer, Michael (1994). Dictionary of the Modern Politics of South-East Asia. Taylor & Francis. ISBN 9780415042192. Porter, Gareth (1993). Vietnam: The Politics of Bureaucratic Socialism. Cornell University Press. ISBN 9780801421686. Quinn-Judge, Sophie (2002). Ho Chi Minh: The Missing Years, 1919–1941. University of California Press. ISBN 9780520235335. Reis, Nadine (2012). Tracing and Making the State: Policy Practices and Domestic Water Supply in the Mekong Delta, Vietnam. LIT Verlag Münster. ISBN 9783643901965. Rowley, Chris (2008). The Changing Face of Management in South East Asia. Taylor & Francis. ISBN 9780415405447. Stuart-Fox, Martin (1997). A History of Laos. Cambridge University Press. ISBN 9780521597463. Zinn, Howard (1995). A People's History of the United States: 1492-present. New York: Harper Perennial. ISBN 0-06-092643-0.